Ring, multi-gemstone (natural / dyed / stabilized) / glass / imitation rhodium-finished steel, multicolored, 16mm wide with chips, adjustable. Sold individually. Item Number: H20-6749JD Have a question about this item? 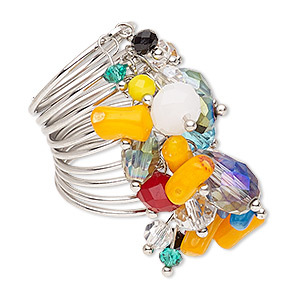 Featuring mixed gemstones, this design presents a fun, moving splash of colorful mixed beads on a bright steel band. 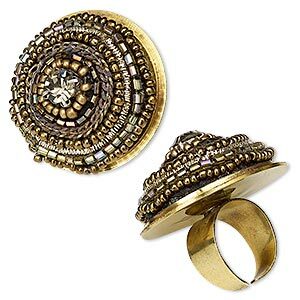 Easy to wear and a great addition to jewelry lines! 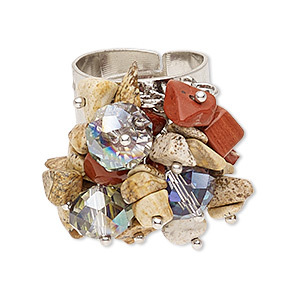 Materials can include magnesite, red jasper, picture jasper and more. Beads can contain AB finish. Colors, shapes and sizes may vary in each lot. Ring, bamboo coral (dyed) / glass / imitation rhodium-finished steel, multicolored, 28mm wide, size 7-1/2. Sold individually. 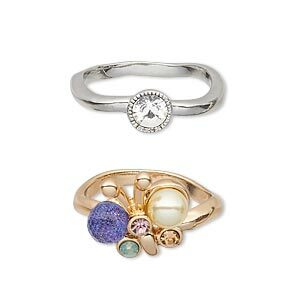 Ring mix, imitation rhodium-finished steel / glass / acrylic, multicolored, mixed size and shape, adjustable. Sold per pkg of 10. 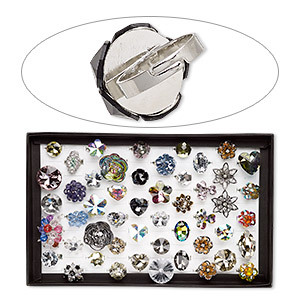 Ring mix, imitation rhodium-plated steel / glass / acrylic, multicolored, mixed sizes and shapes, adjustable. Sold per pkg of 50. 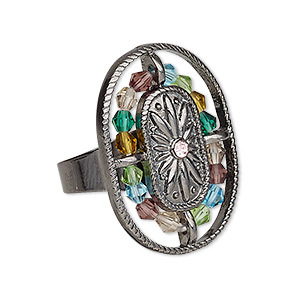 Ring, glass / glass rhinestone / steel / brass, iridescent multicolored, 40mm round, adjustable. Sold individually. 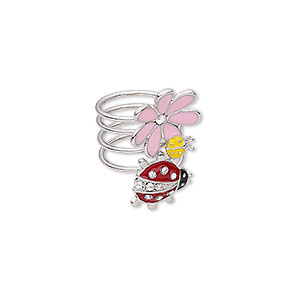 Ring, enamel / glass rhinestone / imitation rhodium-finished "pewter" (zinc-based alloy), multicolored, 35mm wide with ladybug and flowers, size 8. Sold individually. Ring, glass / acrylic / cotton / brass / steel / silver-coated plastic, multicolored, 40mm round with cupchain, adjustable. Sold individually. 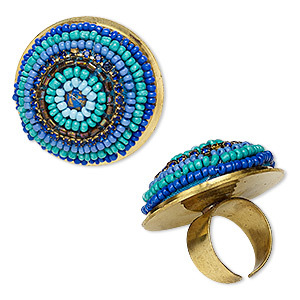 Ring, lapis (imitation) / glass / cotton / brass / steel, metallic multicolored, 40mm round with cupchain, adjustable. Sold individually. 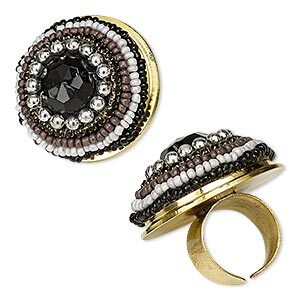 Ring, Swarovski® crystals / acrylic pearl / Czech glass rhinestone / imitation rhodium-plated / gold-finished "pewter" (zinc-based alloy), multicolored, 15x15mm butterfly and 8mm faceted round, size 8. Sold per pkg of 2. 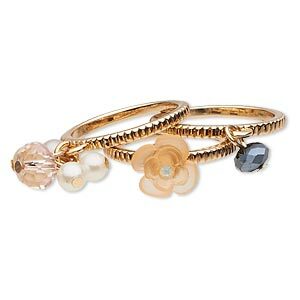 Ring, glass / resin / acrylic pearl / gold-finished "pewter" (zinc-based alloy), multicolored, 2mm wide with 10x10mm flower / 6x4mm faceted rondelle / 13mm dangle, size 8. Sold per pkg of 3. 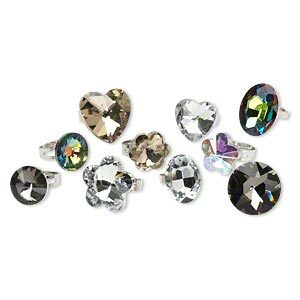 Ring, glass rhinestone / glass / gunmetal-plated "pewter" (zinc-based alloy), multicolored, 32x24mm oval, adjustable. Sold individually.